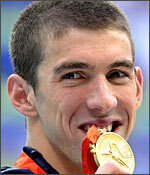 At 23, Michael Fred Phelps has become an international sporting sensation. The young American swimmer has smashed seven world records and won eight gold medals at the Beijing Olympics , the first athlete ever to secure first place so many times at a single Olympics Games. Given his success, it’s easy to slot Phelps into the ‘born achievers’ category — at 23, he’s established a glorious career doing what he loves best, he’s a millionaire, a world record-holder and the pride of his nation. But hold on a minute — is Michael Phelps really a born achiever? He may beg to differ. At the age of seven Phelps, the youngest of three children, was diagnosed with Attention-Deficit Hyperactivity Disorder. For those not familiar with the condition, ADHD is a childhood condition characterised by constant activity, impulsive behaviour and the inability to focus one’s attention on anything for a short span of time. ADHD is treated with therapy and medication, but is not classified as curable — as per information on the website WebMd.com, about 60 percent of afflicted kids carry the condition into adulthood. To help release his pent-up energy and to emulate his older sisters who were also accomplished swimmers, Phelps took up swimming, starting to outshine his peers right from the start. At the age of nine, Michael’s parents divorced. His mother brought up all three children single-handedly, encouraging them to follow their dreams at all costs — one middle-school teacher even told Michael’s mother he would never be a success. But successful Phelps is, and how. So who is Michael Phelps? He was a regular kid who struggled with an irregular condition and the divorce of his parents. He’s young, he excels at what he does and like the rest of us, slips up once in a while. And what life lessons do his struggles and successes hold for us?  Deal with your own issues effectively — Michael certainly dealt with ADHD and his parents’ divorce that way. His mother helped him cope up with his condition and channeled his energy into what he loved.  Cut out the drama — Michael’s story is inspirational but at the same time, neither the young man nor his family have exploited their experiences to sensationalise his life. They’ve told it like it is.  Zero in on your strengths and overcome your weaknesses — He was less than an average student at school, but Michael was a passionate and dedicated student of his sport. The young swimmer is known to have studied tapes of his races over and over, zeroing in on mistakes and working towards bettering himself constantly. Excellent is still not good enough.  Remain focused on your goals — At the Athens Olympics back in 2004, Phelps was beaten by teammate Ian Crocker beat in the 100m butterfly. He put up a poster of Crocker in his room to motivate him and keeps a list of his career goals beside his bed.  Pursue what you love with passion and put in a genuine effort — Phelps’ dedication to swimming was apparent back when he was nine and began to break national records in his age group. His commitment to what he does has grown with him. This entry was posted in Uncategorized and tagged ADHD, Attention-Deficit Hyperactivity Disorder, Beijing Olympics, born achiever, eight gold medals, Michael Fred Phelps, millionaire, Olympics, Phelps, seven world records, therapy and medication, unbelievable performance, young American swimmer. Bookmark the permalink. Not just your Blog Name is very much motivating and so are the articles you choose to write. It is no doubt, your articles bring in everyone who read, a sense of responsibility and encouragement to face the world. I appreciate you for choosing to write these articles and wish you continue to write more such articles to instigate our minds.